Today's comic is classic, in the sense that several other comics feature a similar joke. 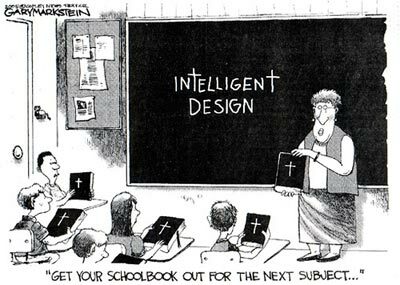 Here we have a teacher holding up the Bible and instructing the children to get out their 'schoolbook' Bibles to learn about the subject of Intelligent Design (ID). Clearly, this is a critique about Intelligent Design being taught in the classroom, which was a big topic when the Dover Area schoolboard tried to read a statement about ID to their class a few years ago. Their argument was that ID presented a non-religious alternative to evolution. Indeed, the proponents of ID are adamant that ID is not the same thing as Creationism, that it disregards religious arguments, and that it focuses on the scientific evidence for design. They argue that, once one has seen the evidence for design, they are free in their religious beliefs to attribute that design to their deity, but that step is not a necessary part of ID. Judge Jones ruled that ID was indeed religious. I have some qualms with his verdict, which I will have to take up in another post. This comic, I think, is a real misrepresentation of ID in its pure form, but certainly reflects a large sample of American ID adherents. It is true that many ID writers are Christian, and they believe that design reflects the design of God. What is unfair about this comic is that, unlike Creationism, ID proponents in a global sense come from all walks of faith, not just Christianity. Many people of Islamic and Judaic faiths follow ID, as do the rare agnostic and atheist. Of special interest are those who believe in directed panspermia. These people believe that life was seeded by extraterrestrial life; although they agree in the evidence for design, they do not believe in creation by God, and, as crazy as it may sound, there have been some famous scientists who believed in this, such as Francis Crick, the co-discoverer of the structure of DNA. Not that Crick followed ID (his perspective was developed before ID), but others who think along the same vein as Crick do. So, the above comic, although admittedly funny, is somewhat misleading. I still don't see what the difference is between Creationism and ID. Why does it matter if one is Christian or not? My impression is that Creationists and ID proponents both believe that organisms were "designed" by some sort of a "creator" and it makes no difference if we call that creator "God" or not. Evolution is different because there is no foresight, although it could be said that organisms are "created" by random mutation, natural selection, and drift. Hi Erica. Its a good question, and one that not everyone agrees on. Some people do lump ID and Creationism together. I follow the lead of philosophers of science who know more than me, who have shown, to my satisfaction, that ID and Creationism have different, although overlapping, histories, qualifications and beliefs. Creationists and ID proponents do indeed both believe that a creator designed organisms. But Creationism is actually not a single entity - there are numerous forms, most of which are specifically and uniquely Christian. Now 'creationism' with a small c is a different thing; all Christians are creationists, in that they believe God created everything, but not all Christians are Creationists, in that they do not share the historical roots or beliefs of Creationists. ID is a broader tent than Creationism - under it all of the different Creationists, who normally do intellectual battle with one another, can find a common point of discussion. But that ID is not Creationism can be seen by the fact that non-Creationists belong to ID, and that some Creationists are anti-ID, providing Creationist critiques of ID. Furthermore, ID makes no religious claims, but religious Creationists can incorporate their faith into ID. It is convoluted, but these differences are important. A friend of mine once called a whale a 'fish'; when I corrected him he pointed out the similarities and said 'what's the difference?' The difference lies, not in generalities, but in the details; and the details matter. Furthermore, may I add that saying that there is no foresight to evolution is a philosophical and metaphysical stance, not a scientific one, and that evolution in some form is accepted by virtually all Creationists and IDers. The appearance of a creator-designer always kicks in right at the boundary of science. When the boundary of science is advanced, then the magical arguments have to be adjusted to the new accepted theory. Just think of Galileo and Darwin, and how the church has "kind" of adjusted to these new theories even though they burnt and or incarcerated a few souls before doing so. The invention of ID is simply brilliant because it encompasses practically all religions, which gives it more critical mass, and also holds some weak arguments to try to filter itself through the legal cracks into the schools. 500 years ago ID would have held that thunder was caused by St. Peter shaking the carpets, luckily there was a guy that wasn´t that happy with the explanation and decided to go forward. Should ID attitude prevail, the thunder fable would probably be currently accepted as it sets a confortable limit.